In the first chapter of the Gospel of John – before the author begins to tell his story – he begins with grand abstract theology taking us back to beginning of time: “In the beginning was the Word…” Astonishingly this Word out of which all things were made became flesh and dwelt among us full of “grace and truth.” And then this: “From his fullness,” John declares, “we have all received, grace upon grace.” A super abundance of grace was revealed in this man who is the light shining in the darkness. As a theological term “grace” refers to God’s love and help, given to us not because we have done something to earn it, but as pure gift, because it is the nature of God to love and delight in us. John uses the word “grace” four times in quick succession in his little theological introduction to his gospel, and then curiously he never uses the word again. It’s almost as if John recognizes that by itself the word “grace” is just an abstraction. Grace needs to be embodied. So instead of talking about grace, John offers us stories into to put ourselves into imaginatively in order to experience something of what grace – God’s gift of love – feels like. John tells seven stories in which Jesus performs what we would call “miracles” – but which John calls “signs” – for in John’s mind the point isn’t to focus on the miracle itself but rather on what the miracle reveals – a God who gives life and gives it abundantly, here, now. This morning’s story is the first of the seven signs – and it might seem an odd choice for the one that gets the status of being the “first” sign: At a wedding party where the hosts have run out of wine Jesus turns water into wine. We are accustomed to Jesus using his powers to relieve human suffering – a worthy purpose for sure. Turning water into wine can seem in contrast almost frivolous. Apparently though, parties – and in particular the shared joy of parties – is near and dear to the heart of God. Wine is a symbol of joy. Wedding feasts were Jesus’ favorite image for what the kingdom of God feels like. At this particular wedding God’s grace brings about an absolutely over-the-top super abundance of wine – perhaps as much as 180 gallons of wine – more than they wedding guests could ever consume. And not just any wine – the best tasting wine ever. This is what God’s grace feels like. So rather than talk about the idea of grace, perhaps it is better for us to call to mind experiences in our own lives when we experienced something of the superabundance of God’s grace. I had such an experience twenty three years ago when I wrote my first real play. I’ve written thirteen plays since, but none has ever flowed through me so rapidly with such a super-abundance of inspiration and creativity. When I sat down to begin writing three weeks is all it took to finish writing. I heard the characters talking in my head, and I jotted down what they said, writing one scene after another till I reached the end. It required very little by way of re-writing. There were two seed thoughts that had been floating about in my head before I began to write. The first came from a short devotional I happened to read a couple of years earlier in the United Methodist publication “The Upper Room”. The author was a woman who described the blessing it had been for her family to have her elderly mother-in-law live with their family during the last year of her life. The old woman’s declining health kept her confined to a hospital bed which because of limited space was placed right in the family’s living room. This was a family with four active teenage children who often brought their friends over to hang out in their house. And so this sweet spirited old woman wasn’t hidden away in her time of her dying — rather she was right there in the midst of everything that happened — a full participant in the life of her family, enjoying the companionship of her grandchildren and their friends. The old woman was essentially in Hospice care, and we generally think of dying as heart-wrenching, but in this case, although there was surely much sadness present, there was also an abundance of grace and joy. The woman writing the piece described those months with her mother-in-law present in their home as being a very special blessing. When the time came for the grandmother to die, though the family surely wept their faith allowed them to let her go, entrusting their grandmother to the light and love of God, cherishing the memories of the special time they had shared together. The story made an impression on me. The woman who wrote the little devotional was named Lillian Gripp, an unusual name that stayed with me, and sometime later when Bill and Amy Gripp moved from Nutley to Parsippany and began attending our church I eventually made the connection: Yes, it turned out Bill had been one of those four teenage grandchildren. The connection seemed a bit mysterious. So twenty three years ago an image began floating about in my imagination of a little girl who talks to Jesus as a best friend – a friend nobody else can see. At some point I put this little girl into the setting Lillian Gripp had conjured up for me – a family with a beloved, dying grandmother present in a bed set up in the dining room. And it was soon thereafter that I sat down to write – and as I said the story just poured through me, and where plays usually take me months to write I was finished with this one in three weeks. Typically when I write plays there is a certain degree of tedium involved – I have to discipline myself to show up in front of my computer to see what I can crank out. But writing this play wasn’t like that. I sat down with anticipation to see what would happen next. Once the play was written, the casting quickly fell into place, becoming very much a family affair. My eight year old step daughter Kate played the girl I named Lydia. My wife Sarah took the part of her anxious and troubled mother. My own mother — a very gifted actress – played the dying grandmother – the only time I ever got to work on theater with my mother. And this was a stretch: I played the pastor the mother calls upon to talk her daughter out of her apparent “delusions” who ends up getting his own faith renewed instead. My oldest and best friend David Turner took the part of Jesus. Tracy’s brother Tim played the angry teenage brother of Lydia. My son Andrew ran the lights. The memory of that production remains to this day a special blessing for our family, particularly since my Mom left this world five years ago. We performed the play here and it seemed to touch people deeply. Our district superintendent came to see the show and he liked it so much he arranged to have us perform it eight months later at our annual conference in the big gymnasium at Centenary College in front of 500 people including all my fellow United Methodist pastors from Northern New Jersey. In our Gospel story this morning a similar point is reached. In those days wedding parties went on for a full week. These weddings required wine, and lots of it. Early on in this particular wedding for some unknown reason the wine runs out. Now this doesn’t rank up there with being diagnosed with a malignant cancer or watching your child starve to death but nonetheless this would have been a major public humiliation for the bride and groom and their parents. From that point on they would have been known in Cana as the people who threw a party but couldn’t manage to have enough wine on hand. Initially Jesus seems to rebuff his mother when she calls his attention to the fact that the wine has run out. Throughout this Gospel John the point is made that we’re not in control. God is. God acts in God’s time and not on our timetable. “The wind blows where it wills,” Jesus tells Nicodemus in the next chapter. “So it is with the Spirit.” We don’t control when the Spirit of God chooses to blow. We simply need to be ready when it does. Nonetheless, Jesus performs a miracle and this super abundance of the best tasting wine is suddenly on hand though the wedding steward and presumably most of the people present are totally oblivious to the graciousness with which God has just acted on their behalf. So back to the aborted opening of our show at Centenary College: I was feeling panic-stricken and utterly clueless as to where to even begin to look to solve the problem. Within thirty seconds, however the lights were back on. It just so happened that a woman contracted by the conference to work the sound system had had the opportunity the year before to become familiar with the dilapidated electrical system of the Centenary College gymnasium. She knew exactly where to go to turn the right switch. So the show proceeded without a glitch. In the last scene the grandma breathes her last breath with her family gathered around her and then, led by Jesus she rises up out of her bed to glide to the end of the stage. There she is met by her husband and the two begin dancing down the center aisle surrounded by sparkling lights. Everybody in the place – myself included – were weeping tears of joy. It would be nice if things in our lives would always work themselves out so seamlessly, but of course, oftentimes it doesn’t. Sometimes the wine does run out and far worst things as well. But it seems to me that the message of our Gospel story is that by and by – in God’s good time – a superabundance of grace and joy will be revealed to us — that in spite of all that seems so terribly wrong in this world – a wedding feast with an abundance of the best tasting wine is as good an image as we have for what God intends to give us. Though we often wait with heavy hearts in the midst of this broken world, Jesus has come to give us joy, even now. Those of you who have known me for a while know that I like to really cut loose when I dance. At wedding celebrations that I attend there are typically quite a few jaws that drop when they see the pastor going hog wild on the dance floor. I enjoy busting the common stereotype that clergy aren’t supposed to be altogether approving of such merriment. But if truth be told, by nature, I am not inclined to be a light-hearted sort of guy. My attention often gets focused up in the pain and sorrow of this world. Though I love to dance, I don’t actually go dancing very often. I typically feel like I have more important things that need to be attended to, and I am prone to feeling some anxiety and guilt if I’m not getting these things done. But that’s part of what this story is about. There central props of the story are significant: six large clay jars designed to hold 20 to 30 gallons of water that were used for ritual purification. The dominant religion of the day was one that was all about keeping the rules – there were 624 laws in the Torah that people were obliged to keep, and if they failed to do so, they were rendered “unclean.” There were elaborate guidelines for using the water contained in those jars to restore a person to the state of ritual purity. So these jars represent a rather joyless form of religion, one where you can never do enough and there’s plenty of opportunity to experience guilt and anxiety. A life of guilt and anxiety – the story is telling us – is not what God has in mind for us. 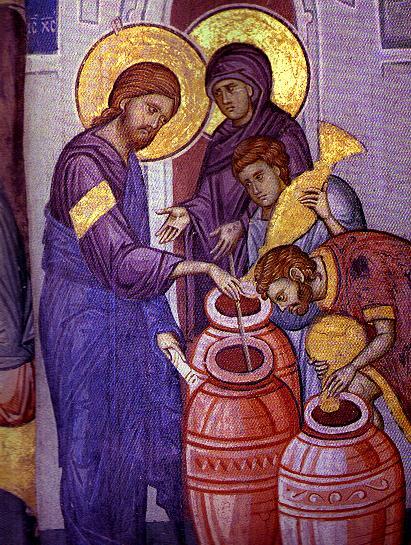 Jesus transforms the purpose of these six large jars: now they are containers of the new wine – the symbol of joy that can get a person up and dancing. That’s what the God of delight likes to see us doing. And this, I believe is the direction God continuously is nudging me towards – and you too as well. When I took a Sabbatical thirteen years ago I had the opportunity to slow down in order to listen for God’s still, small voice. Was that God speaking or was that my imagination? Who knows? but one of the things I believe is that God works through our imagination. We climb inside these Bible stories with our imaginations and we experience something of God’s grace. We imagine ourselves there in the midst of a crowd of five thousand poor, hungry people with no possibility of finding enough food to feed everybody and suddenly this little boy steps forward happy to offer up his lunch to Jesus – just “five small barley loaves and two small fish” — and Jesus takes it and blesses it and has the disciples start passing it out, and suddenly there is a super abundance of food – enough for everybody to have their fill with twelve whole baskets left over. And we ourselves in that story and suddenly perhaps the problems that had loomed so large in our lives don’t seem so overwhelming anymore, and life is seen afresh full of possibility of all kinds of good things happening. Or we are there at a quiet dinner party with Jesus at the home of Mary and Martha in Bethany shortly before Jesus entered Jerusalem to die, and suddenly Mary has this alabaster jar full of very expensive perfume, and she breaks it open and pours out this super abundance of anointment over Jesus’ head, filling the room with a beautiful fragrance. It is a moment of exquisite joy – but then Judas the joyless one speaks up – the same voices that lives in most of our heads — trying to shut Mary down calling attention to the impracticality and wastefulness of Mary’s act – the same kind of wastefulness and impracticality that a seven day wedding party can represent – and maybe the voice inside begins to agree with Judas when suddenly Jesus comes to Mary’s defense. “Leave her alone!” says Jesus. In this moment in which we are living under the shadow of death Mary has brought a beautiful fragrance of joy and for the rest of human history people will draw inspiration from this thing the Spirit has led her to do.